It should hit PC next week. 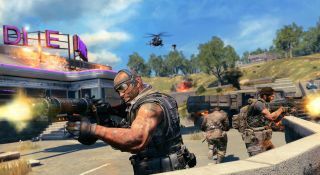 Not only is Call of Duty: Black Ops 4's Blackout free to try for this week (ending on January 24), it seems that Treyarch are pulling out all the stops to get new players involved by adding a limited time mode which will allow players to respawn—with certain limitations. A tweet from Treyarch's twitter account late yesterday confirmed that the new mode is now live on PlayStation 4, meaning it will hit PCs in the middle of next week and run until January 30. The new mode, entitled Down But Not Out, is squads-only and will allow teammates to respawn 'with each Collapse' as long as at least one team member is still alive at that point. Not only will this give new players a chance to get to grips with Black Ops 4's battle royale mode with a good deal less waiting around—and my case, a lot less swearing—but it should also give seasoned players a much more hectic final circle to deal with. Though, as hectic final circles go, I doubt there's much that can beat the chaos that Reddit user bwg11 encountered when he was parachuted—along with 99 other players—straight into the final circle, in what appears to be some kind of hilarious bug. Luckily, he managed to capture the footage that sees players running around in a blind panic (mostly without weapons) while a lone vehicle cruises around the limited area without a single care. While the limited time mode Down But Not Out isn't likely to be quite that crazy, it's probably the closest thing we'll get to what actually looks like a really fun game mode.